By Clemente Lisi – NEW YORK, NY (Jul 9, 2018) US Soccer Players – Look closely at how much New York City FC’s defense has improved in recent years and you’ll discover that one of the reasons involves goalkeeper Sean Johnson. In just his second season with NYCFC, Johnson has helped push the team to new heights. The 29-year-old shot-stopper had spent his entire career for the Chicago Fire, the team that drafted him in 2010. In 2016, he ended up at NYCFC. That’s when his and the team’s fortunes took on a dramatic improvement. Good with both his feet and hands, Johnson has been able to make those around him better. He’s often called upon to make an amazing save to preserve a result. Former NYCFC coach Patrick Vieira, who aggressively pursued Johnson before recently leaving the club for a job with French club Nice, liked to play the ball from the back. Vieira had told the club’s official website in April that Johnson has showcased the use of his feet to help create plays in front of him. 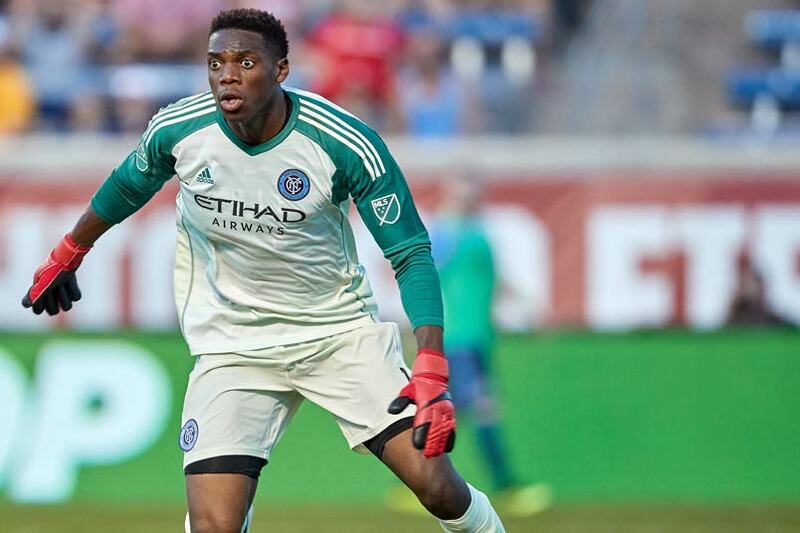 We caught up with Johnson, where NYCFC’s starting goalkeeper talked about Sunday’s Hudson River derby victory against the New York Red Bulls, dealing with the recent arrival of new coach Domenec Torrent, and what he thinks about the goalkeeping at this World Cup. You and your team put in a strong performance at home to defeat the New York Red Bulls 1-0. What did you think of the game? It was a bit of a weird game. The first half was nothing. I think maybe they had one shot. It wasn’t at all troubling (for me). The first half was just a tactical back-and-forth chess match. The second half started to open it up a little bit. We had a great opportunity to finish and we did. I think we did well to possess the ball and we stuck with our principals in what we wanted to do against them. We executed what we wanted to do on the night. The Red Bulls tried to equalize near the end with the ball pinballing all over the box. There were a few plays like that in the game. How do you prepare for those plays and how do you stay alert so you don’t give up a goal? That’s what we train for every day. I think you need to do what you can to communicate with your team and keep yourself in the game. How important was it to defeat the Red Bulls given that you have a new coach who uses new tactics, but has only been here for about three weeks? I think the most important thing for us is getting back to winning ways. We want to protect our home turf and win as many home games as possible – if not all. That’s our goal. This game was one that took a lot of fight and determination. It wasn’t that pretty at times, and they were set up the same way. It was the team that wanted it more that came out and got the victory. You now have a quick turnaround as you host the Montreal Impact on Wednesday night. How do you prepare for the next game so quickly? The more games in a short amount of time the better. It’s just good to get on the field again. We live to play games. We obviously love training, but games are what we’re paid to do. I think the short turnaround will be good. Guys will recover and we have the depth. I think in this moment if we can keep the guys healthy, we’ll be just fine. Have you been watching a lot of the World Cup? There’s been some great goalkeeping at this tournament. What are your thoughts? Yes, it’s been unbelievable. I think all the goalkeepers have been phenomenal. Obviously, (Belgium’s) Thibaut Courtois has been a cut above the rest, especially in the last match (against Brazil). I think (England’s) Jordan Pickford has surprised a lot of people. For me, he wasn’t surprising. He’s done fantastic at Everton and Sunderland. Who do you think will win it the World Cup? For me, Belgium. I think Courtois will help them get there.